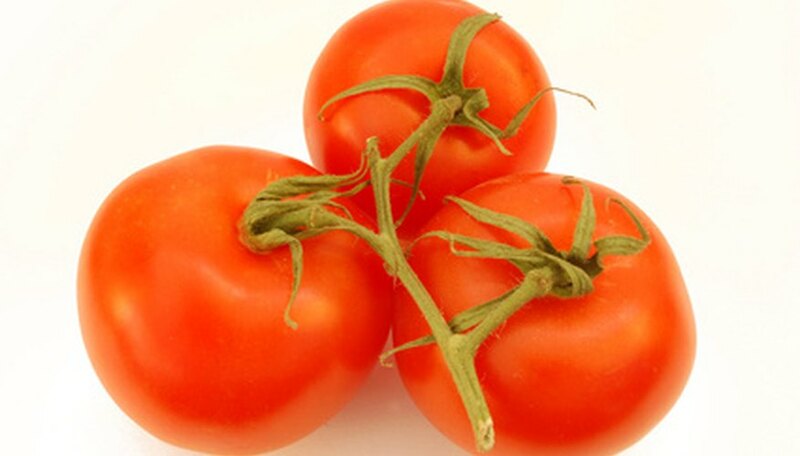 Although tomato plants are one of the most widely cultivated vegetables in the United States, according to the University of Illinois, disease has not been bred out of the genetics. Brown spots on the leaves of your tomato plant can indicate several disease possibilities, generally caused by fungi. Septoria Leaf Spot is a disease caused by the fungus Septoria lycopersici. According to Iowa State University, this is the most common foliar (leaf) disease in tomato plants. Small spots appear that initially look water-soaked, then develop gray and white centers with darker edges. Tiny black spots appear in the center of the spot as the disease matures. Lower leaves are infected first, but the disease spreads to the top leaves over time. This eventually causes defoliage of the plant. Early Blight is caused by a fungus called Alternaria solani. A common early sign of the disease is loss of lower leaves of the plant. Brown to black spots appear on the upper foliage before leaves turn yellow and shrivel. Fruit is attacked at the stem, causing concentric circles to appear on the plant. Warm, wet weather is needed for this disease to spread. Late Blight is caused by the fungus Phytophthora infestans, which infects both young and old leaves of the plant. (It's a different disease from Early Blight, not a stage in that disease's development.) Spots appear as water-soaked areas on the leaves, then enlarge, turning brown or green-black. The underside of the leaves will have what appears to be a white, mildewy substance. Fruits begin to decay and rot, according to Ohio State University. A smell may appear in the garden from the rotting fruit, according to Iowa State University. Both Septoria Leaf Spot and the blight diseases can be prevented through good gardening practices. Plants selected for their resistance to the disease show fewer incidents of infection. Iowa State University suggests spacing the plants so that they will not be crowded once fully grown. This helps foliage dry, preventing the conditions where fungal spores thrive. Remove plant debris (such as old, dead leaves and vines) at the end of the season to prevent the spread of fungi during the winter months. Place plants in areas that are free of disease, where plants have been free of infection in the past. Fungicides, too, can prevent leaf-spotting fungi in your garden. Apply at the beginning of the season, then repeat every 7 to 14 days to reduce the chance of infection. Once plants are infected, however, fungicides provide little recovery. Infected plants should be removed from the garden and burned to prevent spores from spreading.